Baziotis, I., Tsai, C.H., Ernst, W.G., Jahn, B.M., and Iizuka, I. (2017) New P–T constraints on the Tamayen glaucophane-bearing rocks, eastern Taiwan: Perple_X modelling results and geodynamic implications. J. metamorphic Geol., 35, 35–54. Lo, C.H., and Yui T.F. 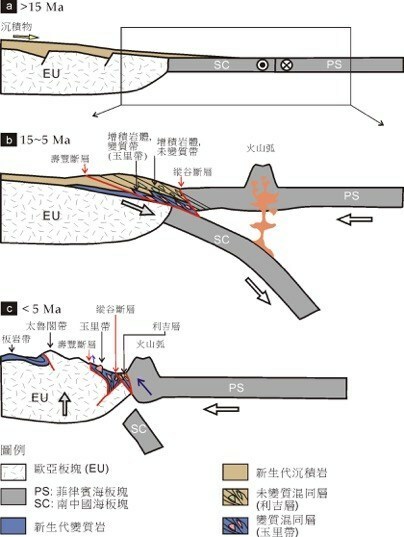 (1996), 40Ar/39Ar dating of high-pressure rocks in the Tananao basement complex, Taiwan, J. Geol. Soc. China, 39, 13–30. Yen, T.P. (1963) The metamorphic belts within the Tananao schist terrain of Taiwan. Proc. Geol. Soc. China, 6, 72–74.